Yeah, that’s a better name than my short-lived (uh, one previous list) “The Five” for these Top Five lists. I mean… it’s moderately better. It’s better-ish. It isn’t terrible? I’ll probably have a new name next time with X% less vanity. Naming things is a process for me; I’m abysmal at it! I struck gold with “Stew’s Reviews” for my comic reviews, and now I’mma just throw my name at everything and hope for the best. Regardless, welcome back! When last we had one of these, I gave you what I considered to be the most heart-wrenching moments in comic book history. We laughed, we cried… mostly we just cried. Because of that damn “I good kitty” line. UGH, it’s getting me again! But this week we’re turning heel and delving into best assortments of villains in all of comics! A dictionary that I didn’t actually bother looking at presumably defines a villain as “the kind of person you chill like” and a gallery as “a place with… art, right? I don’t know“. But in the world of comic books, a line-up of villains–or rogues gallery–is the collection ne’er-do-wells and criminals who tend to antagonize, either as separate individuals or as a collective, a single heroic entity. It’s a weird shtick in comics how so many villains are routinely thwarted by the same hero or heroes. Especially in Marvel! There are approximately eight thousand and twelve superheroes in New York City, but when Electro shows up to rob a bank, it’s almost always Spidey that is there to stop him. Where is Sleepwalker on those days? At least in DC the heroes all have their own city full of individual foes. Anyway, some of these rogues galleries are robust, with larger-than-life characters that are as vibrant as the heroes they battle. Some are… less so. Iron Man, for example! He is an important, popular Marvel protector, and his key villains include the fearsome Mandarin! Good start! And… Fin Fang Foom? And… hmm… Crimson Dynamo? Titanium Man, I guess. It’s not a great roster after Mandarin. This was the hardest part of the list, because the top four were locked-in. The order of them changed in my head frequently, but when I thought of this, four sets of villains came right to mind. It was at the number five spot where the real deliberation came in. There were so many heroes and teams where I could think of two or MAYBE three great villains (The Fantastic Four, The Avengers, Green Lantern), but I couldn’t bring myself to believe three alone was worth a spot. Ultimately, the five hole had to go to the big boyscout from Metropolis. Superman isn’t usually considered as a guy with a GREAT rogues gallery–for whatever reason, Toyman springs right to mind when thinking of Supes’ foes–but honestly, it’s better than you might think, and it’s got great variety. You’ve got people who can’t match up to Kal-El physically, but they rely on their intellect to be a thorn in his side… Brainiac and Lex Luthor (the latter being arguably one of the two most well-known comic villains of all-time… if not the most). You’ve got hulking brutes who can match the Man of Steel’s muscle in Zod, Bizarro, and Doomsday. In Metallo and Parasite, Superman has nemeses who can counter his own powers and force him to rely on new tactics to win. And in Mr. Mxyzptlk, you’ve got a god-level trickster being. And none of these fellas are weak characters, either, with any of them being able to carry a strong story arc, and Luthor, Brainiac, Bizarro, Mxy, and Doomsday especially worthwhile when written competently. Out of, what is to me, the undeniable Top Four rogues galleries ever, I only nicked the enemies of the X-Men for one reason: they combat an entire team of heroes rather than a solo star. So obviously they have versatility and potency built right in. But what makes the regular threats to Marvel’s mutantkind more worthwhile than, say, the rogues of the Avengers, Justice League, or Fantastic Four? Honestly? It’s mostly Chris Claremont. Claremont made the X-Men one of the most popular superhero books of all-time, and there is no doubt that one of the reasons for that is their dynamic array of foes. Magneto is one of the most popular and empathized-with villains ever because he has immense power, a grandiose sense of purpose, and a strong feeling of personal morality to go with the need to do what must be done. Claremont did not create Erik Lensherr, but he turned him from a dime-a-dozen cackling madman to the sympathetic and fluid character we all think of now. After Claremont, Magneto is completely believable as a good guy, a bad guy, or anything in the gulf of a gray area in between. Even without Magneto, the X-Men have terrific rivals. Apocalypse is an incredibly powerful and cunning mutant who has been the center of one of the X-books’ greatest crossovers. Mystique is not quite of the same moral ambiguity that Magneto possesses, but she still is doing what she believes in and has strong relationships with those around her; she took the concept of the Brotherhood of Evil Mutants and used their laughable name to make a political statement. The Hellfire Club are a great analogy to the extremely wealthy and powerful of current world, and they use influence, subtlety, and money to pull strings rather than in-your-face power. Sabretooth, Juggernaut, and the sentinels are all high caliber foes. You could tell dozens of issues’ worth of great mutant books without repeating X-Men enemies! The assortment of madmen who more-or-less invented the idea of a rogues gallery isn’t even in the top two? Maybe I should be in Arkham Asylum! But it’s not that I’m downgrading these fine foes as much as that I’m really sold on #1 and #2 after great consideration. Even non-comic fans, if asked, could name, what?, at least five or six Batman villains in a few seconds. They are household names! They’ve starred in movies and acclaimed cartoons and cult classic television shows. Joker, Harley Quinn, Two-Face, Bane, The Riddler, Mr. Freeze, Scarecrow, Poison Ivy. EVERYBODY knows these characters. And while some admittedly have less depth than others, they are all famous because they are huge personalities with distinct designs and an abundance of flair. You can’t deny the level of success and popularity the Bat rogues have achieved. 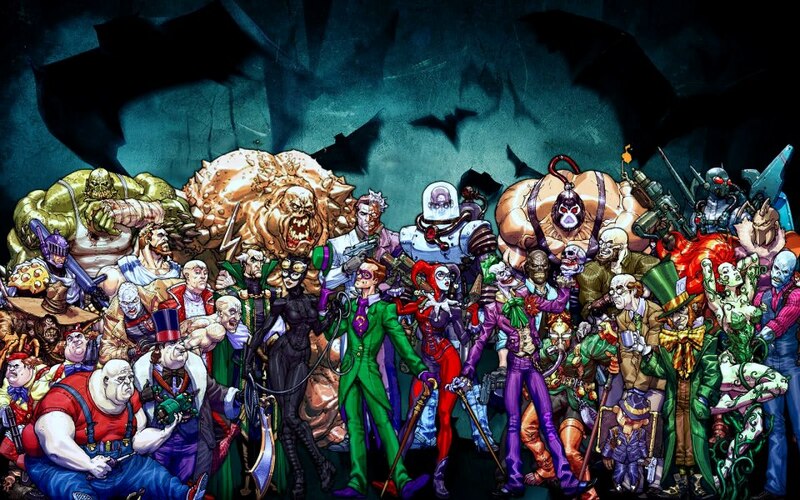 Even the lesser known baddies here could be strong villains for another character; folks like Zsasz, Clayface, The Mad Hatter, Man-Bat and Killer Croc are all big names who just get buried under the torrent of unquestionably classic villains. The Flash’s villains took the idea of a “rogues gallery”–indeed, took the very name behind it–and gave it a purpose. Not just a purpose, but a code and a set of standards to which they should aspire. The Rogues know who they are and what they want, but they also have lines they won’t cross. 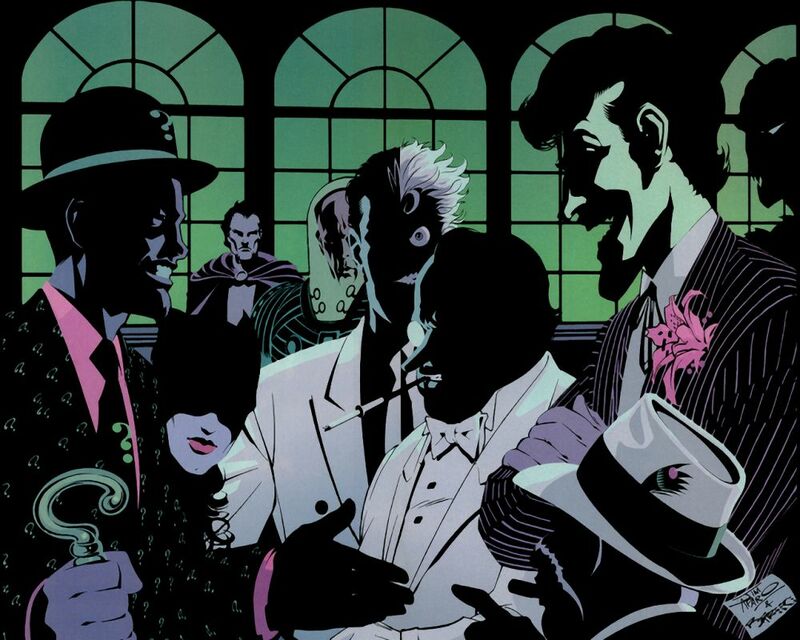 The Flash’s rogues gallery comes in at #2 because it takes the idea of Batman villains–gimmicky characters with colorful names and fantastic costumes– and marries with it a mature attitude and the idea that , if all these villains are being countered by the same man, why not form a permanent alliance to succeed around him? And under the leadership of Captain Cold, the Rogues have become a well-oiled machine. Rarely ever outright defeated, and more often playing multiple angles to get everything where they want it, fun characters like Mirror Master, The Trickster, Heatwave, Weather Wizard and others that have filtered in and out have gelled into a hurricane force in the DC Universe. Not to be outdone by their unionized brethren, Flash’s non-Rogues enemies are also high quality. Reverse-Flash (Thawne) and Zoom (Zolomon) are both extremely powerful and tied personally to the two main Flash heroes. Grodd joins ferocious physical power with terrifying mental capabilities, and is a large, vicious, bloodthirsty ape! And honestly? I’d take Flash’s lower tier foes (Top, Kadabra, Magenta, Cicada, Girder, Murmur) over Batman’s any day, even though the latter are still very good. Flash just has a balanced, deep collection of baddies of which any hero should be envious (or frightened). Yeah, I mean… yeah. It has to be. Ol’ Web-Head has the best villains in comics. Quick… who is the #1 Superman foe? It’s Luthor. What about the X-Men? Definitely Magneto. Batman? The Joker! And The Flash? Eobard Thawne. But with Spidey? Who IS his #1? Is it Norman Osborn, the man who killed the love of Peter’s life? Or is is Doctor Octopus, the one who defeated Spidey, killed him, and stole his life? What about Venom, the insanely popular “dark” version of Spider-Man who counters him so well? There are three legitimate contenders for the top spot here, and they are all fascinating, developed characters; what other hero can say that? 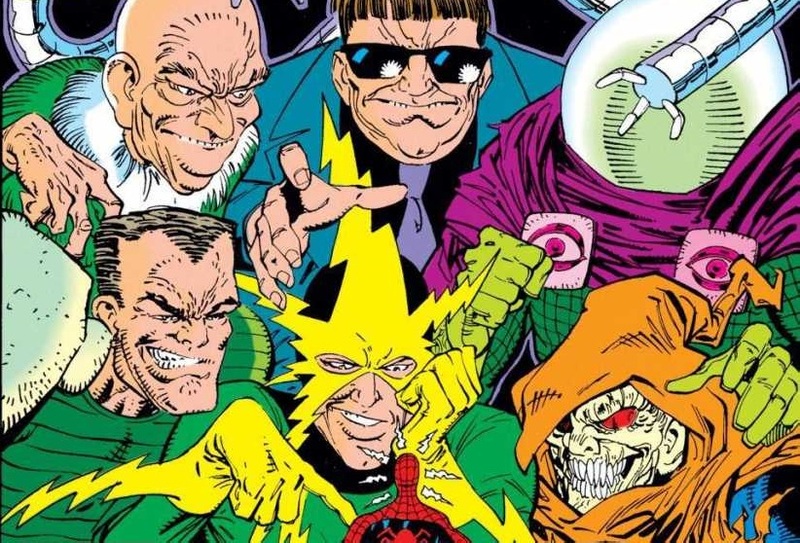 Not unlike Flash’s Rogues, Spidey’s nemeses have also often sought to team up under a united front to beat the webbed, most often in the forms of either the Sinister Six or the Sinister Syndicate. Neither run has ever had the long-term success and solidarity of the Rogues, but they have had their own titles, including Superior Foes of Spider-Man, one of the best series of the last decade. That’s how good Spidey’s enemies are; a book about some of them was better than almost every book being published about good guys! You have to love the Spidey villains. You have to love Electro’s mask and Sandman’s power and Lizard’s creepiness and Morlun’s tenacity. There are so damn many people here that could be any other hero’s #1, and to Spider-Man, they are all well behind those other three. Hands down, they’re the elite. So what do you think? Agree? Disagree? Who ya got, and what order you got ’em in? Let us know!